The Little Black Book of Suicide Notes is also available as an audiobook. Read by the author herself, it weaves together the spoken word with a classic rock song and a carefully crafted soundtrack to create a powerful, immersive experience. BONUS TRACK: A rendition of “Suicide is Painless” (Theme from M.A.S.H.) by Tony Noe. Royce tackles the “elemental questions” with great courage and clarity, and this makes for a most intense read. You may be moved to applaud or dramatically disagree with what she has the courage to say, but one way or another, you will be provoked to examine your life; something we can all use a little more of. Suicide should never be taken lightly. According to the latest research, it is the 10th leading cause of death in the United States and has caused immeasurable pain and suffering to families around the world. But what about those who have contemplated suicide and lived to talk about it? What can we learn from those who have looked so directly into the face of death that they discovered something about life? 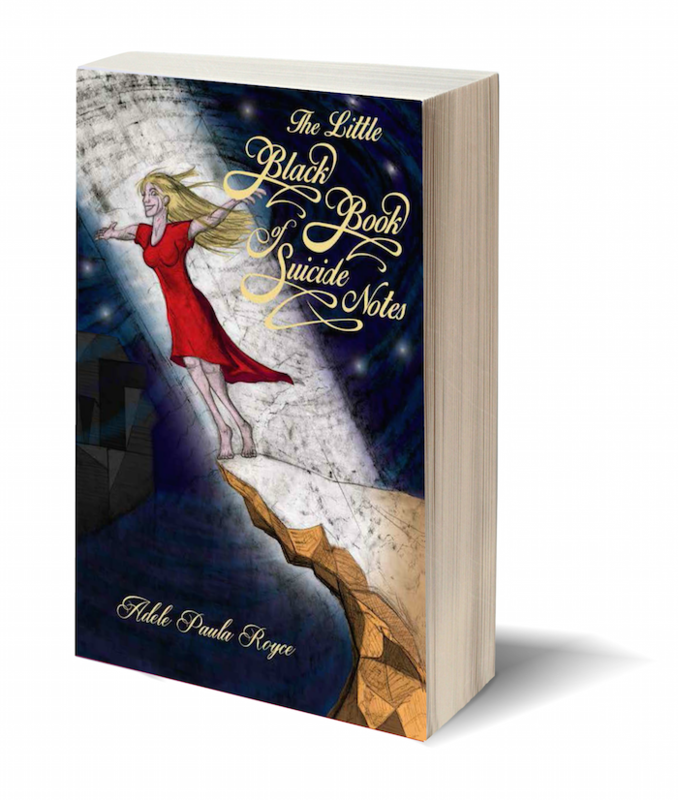 In her debut novel, The Little Black Book of Suicide Notes, Adele Paula Royce presents a semi-fictional look inside the mind and heart of a tortured soul who is on the verge of ending her own life. Through this raw and authentic journey into the heart of darkness, Adele shines a unique light on the human experience that leaves you more inspired to live life to the fullest. Why Is There No Answer to A Why Question? Even if you’ve never considered suicide yourself (though research suggest that most people have at some point in their life), you’ll find resonance with her story. Each note takes you deeper down the rabbit hole, and conveys a kind of philosophical bravery that comes from facing your own demise. By the end, you’ll find yourself looking at life in a new, and surprisingly optimistic way. The little black book of suicide notes offers us a glimpse into the mind of less options, and in so doing, it asks you to reflect on your own. Simple, untold tales written with insight and thoughtfulness. It lets you see how even the jagged thinking of a troubled mind, can make sense of the senseless. it doesn’t pretend to know the answers…but it certainly leads you to question. The little black book of suicide notes brings help to the helpless. As we try to address the issue of suicide and mental health in this country, we need the kind of introspection that Royce provides in this book. The Little Black Book of Suicide Notes is a step in the right direction. One part suicide journal and one part spiritual memoir, Adele’s novel is really a tale of life, death, and rebirth. She draws upon her own rich history of spiritual practice and inquiry to look at suicide from the deepest possible level. In doing so, she uses her character to show us how to live by showing us first how not to live. And by going into the deepest darkness she finds a different kind of light at the end of the tunnel than she expected. With an Artistic educational background spanning from the famed School of Visual Arts in NYC and a degree in Fine Arts and English Literature from the City University system, Adele Paula Royce paved her way onto the Corporate America scene. She envisioned corporations artistically as a blank canvas, and utilized a Jackson Pollock technique of colorful truth to secure those business relationships. Instead of talking about products and services, she taught them about Thoreau, quoted Biblical scripture, and shared stories of inspiring fascination that kept the executives coming back for more…invariably the business followed. Adele took a 2-year break from Corporate America to manage the career of a singer/songwriter, and via the same technique paved her way onto the music scene and into the boardrooms of some of the music industry’s famed elite. She has always been a seeker of truth, and more than a decade ago began studies under the tutelage of a Master teacher of Western Spirituality. She has been a student of Kabbalistic Practice ever since. Adele currently resides in NYC. Adele Paula Royce has brilliantly crafted a protagonist who struggles with her inner darkness. The Little Black Book of Suicide Notes implores readers to reflect on their own lives with clarity and care. Royce writes openly and with truth – offering a story that is both validating and uplifting. Adele Paula Royce tackles a serious issue confronting society today, where some people due to emotional, physical or spiritual involvement are unable to find a clear understanding of life’s meaning. As a result of not knowing the true nature of their soul/divine essence they live in the material world often accepting suffering due to depression, illness or difficult environmental cultural, religious and political issues which cloud their ability to feel safe and happy in this world. Many gifted and talented people throughout the ages have been unable to accept abominable behavior and have made the choice to attempt suicide. We can certainly understand this, however: READ THIS BOOK to know that a suicidal person should be respected for their feelings and impulses and not labeled or judged. Ultimately learning about ones sensitivity to energy and Universal Laws and finding spiritual tools to manage daily life can help turn the tide and let those people who are challenged find a positive way to know “they are not alone in their aloneness.” Adele Paula Royce by sharing 27 entries contemplating the thought provoking question whether or not her life is worth living exposes the true depth of pain and life in all its complexities and may offer hope for finding that life is indeed a gift and it is possible to move past suicide in an effort to find beauty and love in this world.